WATER POLO Undefeated in league, the team improved after tournament struggles. Senior Kristina Mariani goes one on one with the goalie after getting free from Chaffey’s defenders in the close contest. Thriving in the new league undefeated with a record of 5-0, the Diamond Bar High School girls water polo team is well on its way to win the league title. In the first league game, the Lady Brahmas dominated Chino Hills 18-7, and continued with their winning streak, solidly defeating Ontario 14-1, Chaffey 10-8, Don Lugo 14-4 and Montclair 13-6. After moving up to the Mt. Baldy League in Division Four, the Brahmas are generally facing teams in league matches that they have never gone against before. “The season has been good so far. We are undefeated in league… I expected it to be up and down in the beginning, but currently we are performing very well,” coach Devin Hunter said via email. 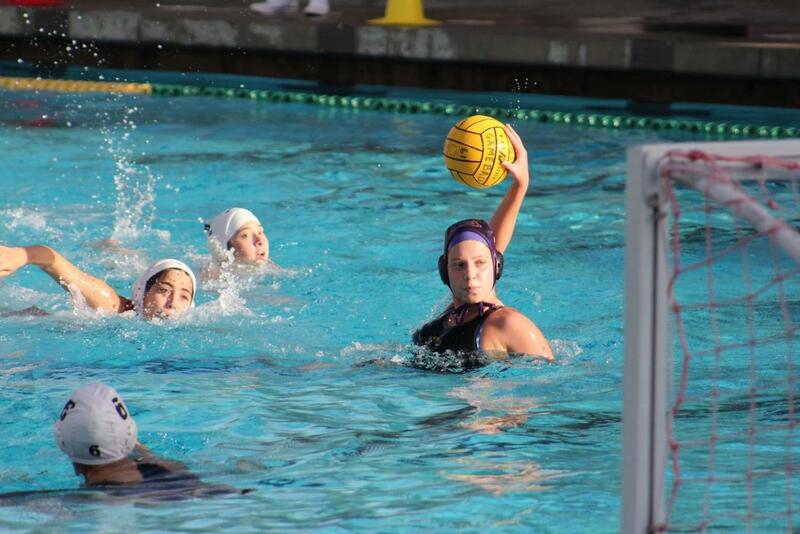 Recently, DBHS girls water polo participated in the Claremont Tournament, finishing with a record of 1-3. The Brahmas lost to Poway 13-3, Valhalla 14-8 and West Hills 14-8, but salvaged a win against Warren 12-4. Despite the disappointing results, Marron said that the tournament helped identify their weakness. “We all [got] really frustrated with one another… We can be doing good one second and then there is one bad move and everyone completely shuts down on one another. These tournaments seemed to help us see where our weaknesses are,” Marron said. Another tournament that the girls competed in was the DBHS Winter Classic. With a record of 3-2, the Lady Brahmas dominated over Rowland 13-8, La Mirada 14-9 and JSerra 8-5, although they lost to Buena Park 11-5. To continue doing well in league, the girls spend the first half of practice swimming and conditioning and the second half drilling and shooting. According to Marron, the team is focusing on building up endurance. “We have proven so far to be the best team in the league. Playoffs will be tough now being in Division Four… [but] it will provide some challenges that I look forward to,” Hunter said.